Many of you may be surprised to learn that healthy kids don’t always eat healthy foods! It’s tragic I know. The sad reality is they are old enough to make their own choices when they aren’t home, and they don’t always choose green peppers when there are chips around. As a mother I’ve thought long and hard about this, and although I feel like my years of influence are quickly going away, there are still a few things I can do to instill the desire for healthy eating in my kids. Most importantly, it is possible to create a home environment that is different from the world. It can be an island where we control what happens! Your home should be a place where junk food doesn’t permeate your pantries, and where healthy food is always part of the environment. As parents, we can dig a mote around our island we call home! A deep enough mote, where high paying junk food advertisers and peer influences can’t cross over. We can do this and we can keep our kids healthy, despite what the world is doing to them. Here are my 5 ways in which I think we can dig this mote deep enough to have an impact on our kids. Do not use your grocery budget to purchase junk food! What a waste! If you think you will be depriving your kids, think again. 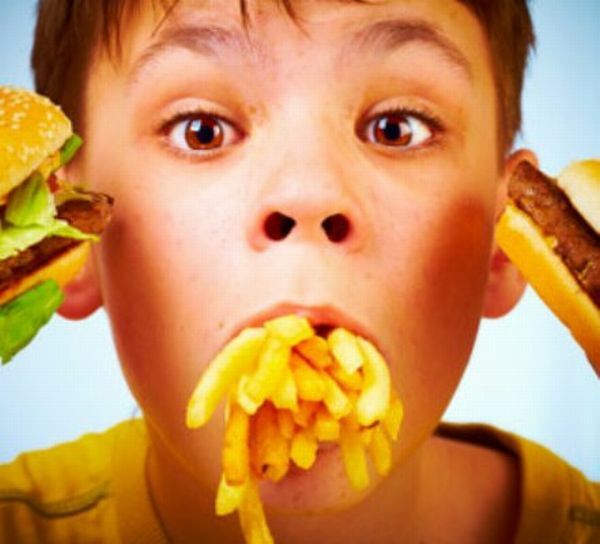 Between school, church, little league and grandma’s house, kids today have loads of opportunity to eat junk food. The foods we never buy and bring home include: Chips, fruit snacks, packaged desserts like cookies, soda pop, or anything from the candy aisle. To have these in our pantry would send mixed messages about our desire to be a healthy family. Let healthy food be a natural part of your kitchens environment. It’s not enough to avoid buying junk food, but you also need your kids to have access to a variety of healthy foods! Fill you fridge and counter with fruits and vegetables. Stock your pantry with dried fruits, nuts, seeds, or homemade granolas. Kids will learn that they get what’s available. While they are young, they can not go purchase their own hot dogs when they have a craving. What you include in your kitchen is what they can eat. Limit television! There is something amazing about having a leprechaun send you on a magical adventure with shooting stars and horseshoe marshmallows. What kid wouldn’t get excited about eating tasty red hearts and green clovers. I used to not consider that my kids were that easily influenced until one year when we didn’t have cable. I remember that year, they always knew which toys were being offered at the fast food joint, and they begged me to take them. Their Christmas list was literally a full page long. The next year we had no cable. I did not have one single request for fast food, and they couldn’t think of ANY thing to put on their Christmas list… so interesting! Be united. Get your kids on the same page with your plans for healthy eating. Print out a meal plan, and hang it on your fridge. Kids like to know what to expect. You can look at your meals for the week, and decide together who is going to help make the meals! You can shop together, you can grow the food together, and most importantly, you can eat together! Work them towards independence where they are packing their own school lunches with the things you think they should be packing. Celebrate food, together! Food is part of our celebrations, our culture, and our gatherings. While I detest using food as rewards, I think food as part of our social landscape is a great part of human culture. Eating dinner together as a family comes with loads of benefits, but also family parties can be a great place to teach kids how to enjoy healthy food during fun occasions. This message is so important in a world where kids are instead learning to eat by themselves in a dark room in front of a screen. This type of eating almost inevitable comes with processed junk food. So there you have it! Parenting is hard. My favorite quote is, “if you think parenting is hard, you are doing it right!”. It’s easy to ignore or minimize the importance of teaching your kids to have a healthy relationship with food, but the sooner you can do these things, the sooner the lessons will be learned.